Oshkosh, WI was graced with beautiful, albeit windy weather last weekend as Sonex Aircraft, LLC hosted it’s 35th Sonex Builder Workshop. Approximately 70 folks were in attendance building a hands-on metalworking project, learning volumes of information about Sonex and AeroConversions products, and seeing Sonex factory prototypes and customer-built aircraft show their stuff overhead. Eight Sonex Aircraft, including the new Sonex Sport Acro, were on display. On Saturday evening, Joe Norris from EAA’s Aviation Servicesdepartment spoke to attendees about registering experimental/amateur-built aircraft with the FAA, issues relating to the Sport Pilot rule, as well as the rules governing self-launched gliders like the Xenos. Bob Mackey of Falcon Insurance, managers of the EAA Aircraft Insurance Plan, was also on-hand to talk about insuring homebuilt aircraft. The next workshop is scheduled for September 6-7, 2007. Space is limited, sign-up today! 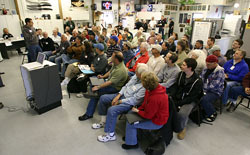 Sonex Workshop attendees received plenty of hands-on metalworking experience during the two-day workshop (above). The weather permitted several flying sessions and Sonex Workshop attendees got to see Sonex Aircraft in action (above and below). Attendees swarm around Sonex employee Kerry Fores’ Jabiru 3300 powered Sonex, and even ask him to pose for a picture (above). There’ll be no living with Kerry now! Workshop attendees watch Jeremy Monnett taxi-out in the factory prototype Waiex (above, left). John Monnett gives several building tips using a partially-completed Sonex airframe (above, right).